Sizemore draws a walk. We've got runners on the corners with 2 outs in the bottom of the 9th. X to the plate. Balfour walks Sizemore, runners at 1st & 3d for Bogaerts. 2 outs. #Rays 6, #RedSox 5. Sizemore draws a walk, so #RedSox having winning run on 1B, tying run on 3B, Bogaerts up, Pierzynski on deck. #Rays discussing options. Sizemore up, 4 for last 42, tying run on 3d. Sizemore up, 4 for last 42. 2 outs, go-ahaed R on 3d. Napoli K's looking, 2 outs. Ortiz ground out tt Loney at 1B, Victorino to 3d. Wall ball double for @ShaneVictorino and @davidortiz steps to the plate as the rain begins to fall. To the bottom of the 9th we go. Down by a run, Balfour on the mound. Vic to lead off. Looking for #WalkOffCity . Call stands. to the bottom of the 9th we go. Maddon challenges the caught stealing. If the Red Sox have to retake the field, there will be blood. Nice start for @JakePeavy_44 . 6 up, 6 down. At the park? 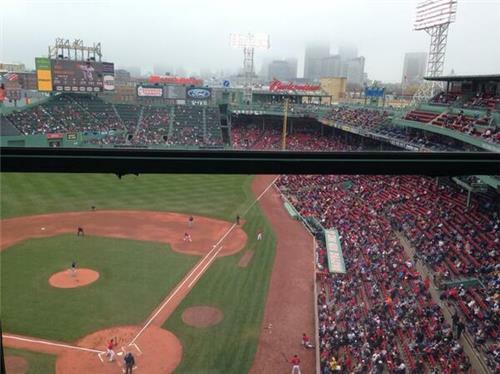 Tag tweets/Instagram pics w/ #MyFenway . 5 secs. of fame on videoboard/social wall! RBI single for Gomes to take a 1-0 lead after 1. We threaten more, but leave 'em loaded. Ramos with a 35-pitch inning. #RedSox worked Ramos pretty well. But only one run to show for it. #RedSox send 7 batters to plate in 1st, but score just 1R, leave bases loaded. 1H, #Bb , 2K. #Rays Ramos threw 35 pitches, 17 for strikes. Bogaerts walks and now it’s evident why the Rays did not want to play two games today.